Doing this for your recorded lectures isn’t necessary. Consider it if you use Replay outside of the classroom to create materials for your students to view in their own time, or if you want to link to sessions in Blackboard content areas to provide more context. While you could just copy & paste links to sessions, you run the risk of linking to something that your students don’t have the rights to see. 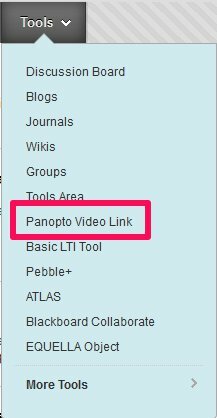 Use the Panopto Video Link to only add sessions that your students can see. 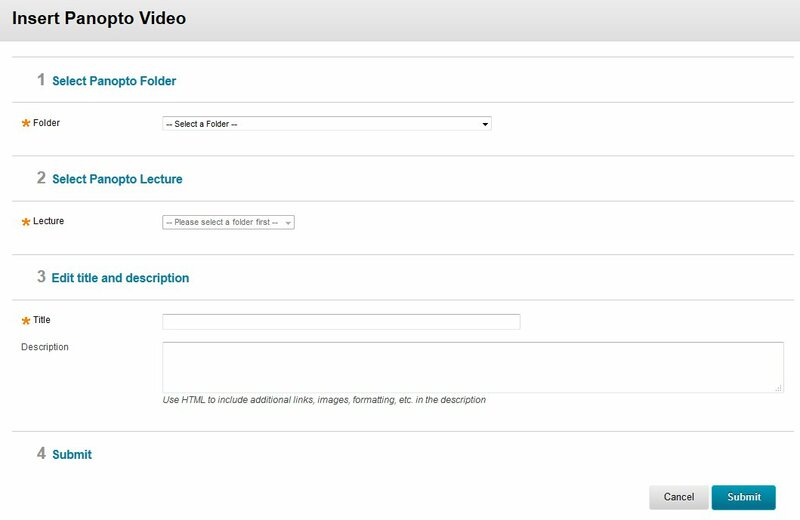 If you want to add a link to a session contained in a different Panopto folder, you’ll need to add that folder to this Blackboard course before you continue. If you don’t want all of the sessions in that folder to be available in this Blackboard course, consider copying the session instead. Select the Panopto folder the session is in. Note this drop down will only show folders available to this Blackboard course, as well as public folders, preventing you from linking to sessions the students can’t see. Add a title and an optional description.